with archive photos, family history data and fascinating stories from the past. I hope you enjoy this site and find something of interest. Please use the menu to explore the site. 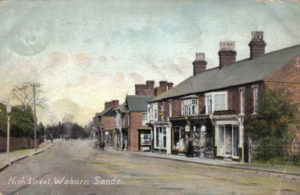 The Woburn Sands Collection is a private collection of artefacts, postcards and documents about Woburn Sands and district, collected since 1989. Where items have come from another source, it is attributed to the copyright owner. You may use any of the work for private study or personal use, but if published in any format elsewhere, please indicate this website was the original source. Please check with the attributed owner before using any work other than mine. If you have any questions about the history of the district, the people, the buildings, or the items shown on this site, I will help if I can, or direct you to someone who may know. If you have researched a local topic or family, and would like to share your findings, please contact me. Please type the e-mail address you can see below into your e-mail. I am sorry there is no direct e-mail link button, but this is to prevent spam. Join the Facebook group “Woburn Sands and Aspley Heath History” to see the latest photos to be discovered, discuss local heritage or ask any questions about Woburn Sands and district. I am looking to acquire the following items. Contact me on the e-mail above. Any postcards of WOBURN SANDS, ASPLEY HEATH, WAVENDON or WALTON, or of other local places if they come from shops or photographers in Woburn Sands. These could be postcards from photographer Robert Cheetham, who embossed the lower corner of cards “R A Cheetham”. Postcards from Bathurst’s Pharmacy (or Pharmaceutical Chemist). 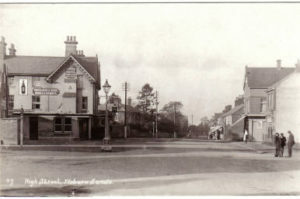 Postcards from Pikesley of Woburn Sands, or Gregory Sandpine (or Sanpine) cards. 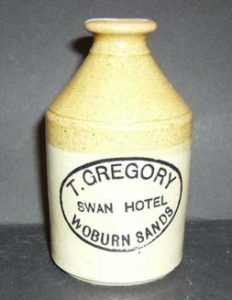 Any bottles, flagons or pots marked WOBURN SANDS, ASPLEY GUISE, WAVENDON, or “DOWN & NEEDHAM”. Also any stoneware flagons from the other towns that make up modern-day Milton Keynes, e.g. Bletchley, Fenny Stratford, Newport Pagnell, Wolverton, Stony Stratford, etc. Original books (not modern ‘print-on-demand’ copies) by Jeremiah Wiffen of Woburn, George Castleden of Woburn, or Rev. John Fisher of Wavendon, as well as guide books to the local district. Any of the 1st, 2nd, or 3rd edition O.S. maps of 6-inch or 25-inch-to-a-mile sheets, covering Woburn Sands, Aspley Heath and Wavendon. Bill heads, Newspapers, Deeds, Auction programmes, Auction plans, Photos, Posters, or anything else pertaining to the Woburn Sands, Wavendon and Aspley Heath area.